A Battle Belt, also known as War Belt or Combat Belt is load bearing equipment intended to keep important equipment within easy reach. 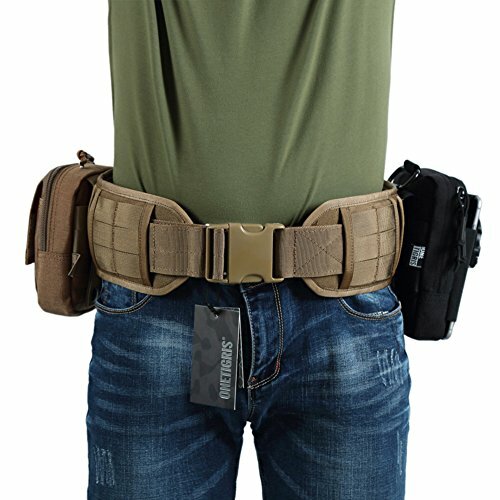 Shown here is the 5.11 Tactical VTAC Brokos Battle Belt (Buy on Amazon). This is the Viking Tactics Battle Belt as sold by 5.11. 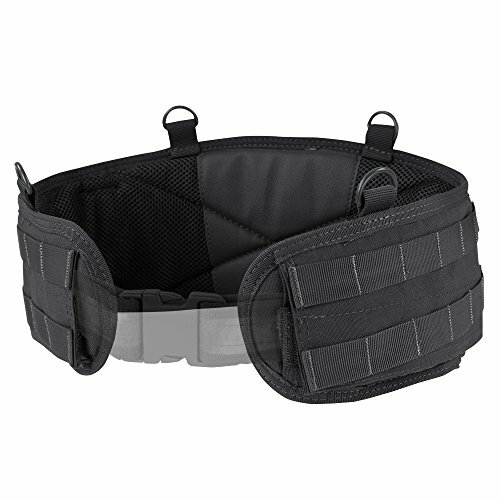 A battle belt consists of a padded sleeve with rows of MOLLE PALS webbing for attaching pouches and accessories. A battle belt typically requires an inner belt (web belt or tactical belt) to secure it around your waist. A battle belt let’s you have all your essential gear within easy reach – and the weight is supported by your hips. It’s also very quick and easy to put on a belt. If you need to carry a lot of heavy gear (spare magazines, radios, holsters, IFAK, knife, gerber multi-tool, etc.) a regular belt won’t cut it – there is not enough space for one, and it won’t be comfortable. Battle belts are tough, and usually have lots of MOLLE webbing – so you can customize and attach utility pouches and accessories of your choosing. These belts help you keep all your critical gear within easy reach. The padding and ventilated mesh fabric used will ensure the maximum comfort with a heavy load. A battle belt is a great option for convenience on the shooting range – whether you are practicing or participating in a 3-gun competition. Why? Just think of all the gear you need – mags, ears, gloves, multi-tool, ifak, and more. 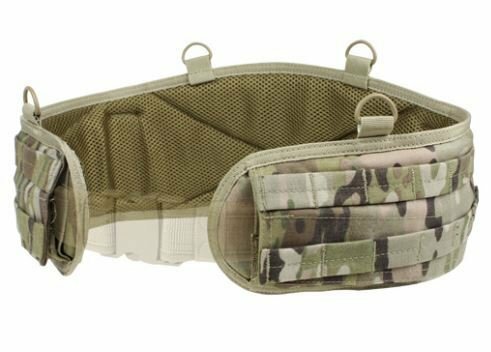 Whether on a mission, the job, hunting, larping, on the shooting range or airsoft, a battle belt can be a great option for you. For more real world information on the use of a battle belt be sure to read War Belts: Rigging Up for Battle. 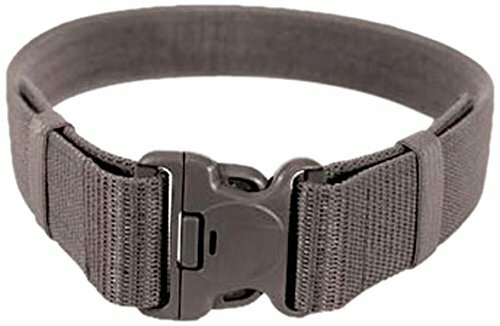 What should you look for in the best battle belt? It is not uncommon for these to be made from 500 Denier (500D) Cordura or even ultra tough 1000D Cordura. MOLLE/PALS webbing for customization and compatibility with utility pouches and MOLLE accessories. PALS (for Pouch Attachment Ladder System) is rows of webbing – heavy-duty nylon stitched onto the belt to allow for attachments. This allows endless versatility for securing items and adding attachments. Some battle belts have 2 rows of MOLLE and some have 3 rows. More rows of MOLLE usually means a wider belt. It’s a trade-off between size/bulk, comfort, and being able to securely attach all your gear. Some are compatible with standard belt accessories as well. Look for light-weight, but understand that these belts are tough and durable – and some have extra high-density plastic inserts to ensure a heavy load can be carried in comfort. These will be heavier than your average belt. Some have mesh fabric for breath-ability or foam filled pads for comfort. These belts are usually very wide or broad – and this helps spread out the load being carried evenly on the hip. Some belts have attachment points for harnesses or combat suspenders. This will help keep everything secure and helps with carrying an extra heavy load. Many will feature a quick release buckle. 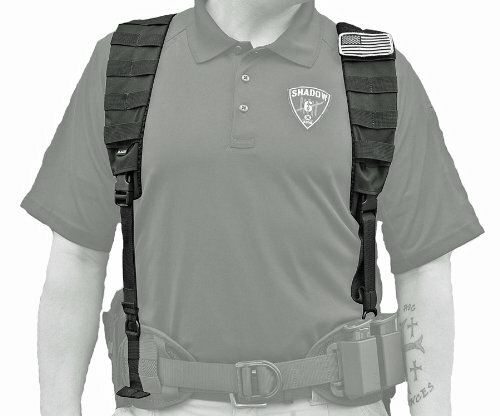 Some will support a drop leg holster (or two) – but this requires “bottom” access to the inner belt. Please note that for many of these an inner rigger belt, web belt, or tactical belt is required for use with the outer battle belt. 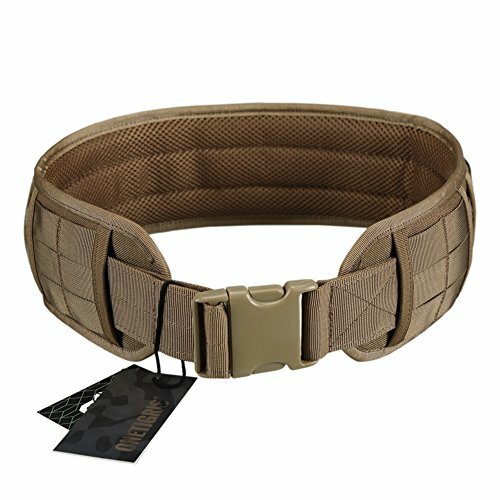 Lengths S. M = 26.5", L. XL = 33", 2 3x = 42"
Our premium battle belt pick is the 5.11 Tactical Men's VTAC Brokos Belt (Buy on Amazon). This is the Viking Tactics Brokos Battle Belt, sold under the 5.11 Tactical name. It’s only 8 ounces – but made from tough 500D Cordura. On the back there is hook and loop (velcro) instead of MOLLE – You can’t reach anything mounted on the back – so this is a good use of space. 6 inch high-density plastic inserts are used to reinforce the belt – this helps further with heavy loads. It is padded with 3D spacer mesh for breathability and comfort. You will need to combine this with a tactical belt or web belt. Another reason this battle belt is our premium pick – it’s highly compatible with Kydex holsters and sheaths. Notice the pass through sections in the battle belt allow you to weave the inner web belt outside of the battle belt – where you want to. This allows you to run a Kydex holster (drop leg or otherwise) without having to figure out another way to attach it to the MOLLE webbing. 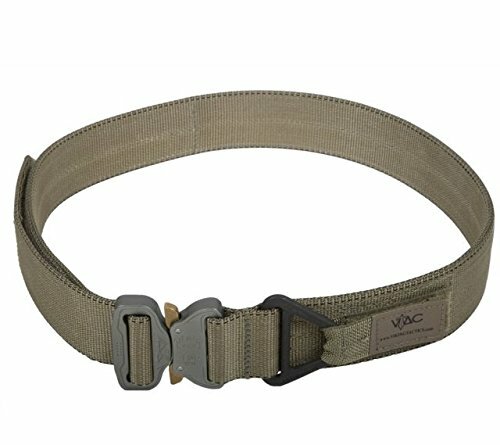 Regarding that required tactical or web belt – we’d recommend the VTAC Cobra Riggers Belt (Buy on Amazon), also by Viking Tactics. Find out more about the VTAC Brokos Battle Belt here, this gives a better idea of how this can be used easily with holsters. 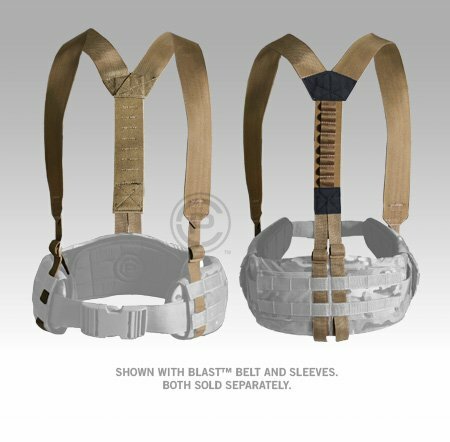 Pair it with the 5.11 Tactical Brokos VTAC Harness (Buy on Amazon) when carrying extra heavy loads. 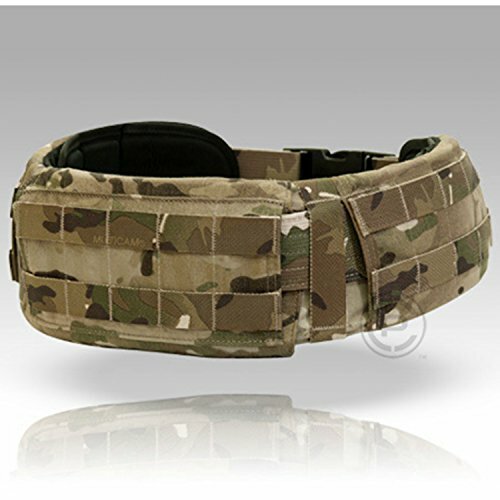 The Crye Precision Low Profile Belt (Buy on Amazon) is another top-quality item. This is made by Crye Precision, which is a top tier manufacturer for tactical gear. There is also a soft armor insert available for this belt (not included). It is made in the USA, of US materials. It will work with the Crye Precision suspenders (Buy on Amazon). OneTigris is paintball quality gear – but if that’s what you need – it’s great. This belt has 2 rows of MOLLE webbing, rather than 3 rows. This makes the belt a bit thinner. You want enough MOLLE to securely attach items, but you don’t want so much that the belt is too wide – and a hindrance to movement or comfort. 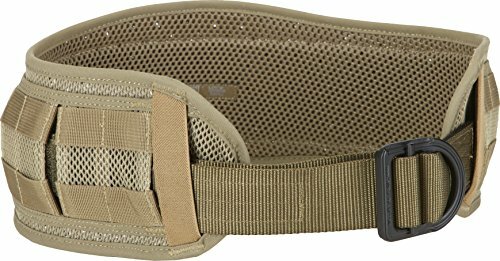 This particular battle belt is popular for the gun range, airsoft, and paintball – because it’s quite affordable. For this model, you must supply the web belt or tactical belt – the belt is not included. The BLACKHAWK! 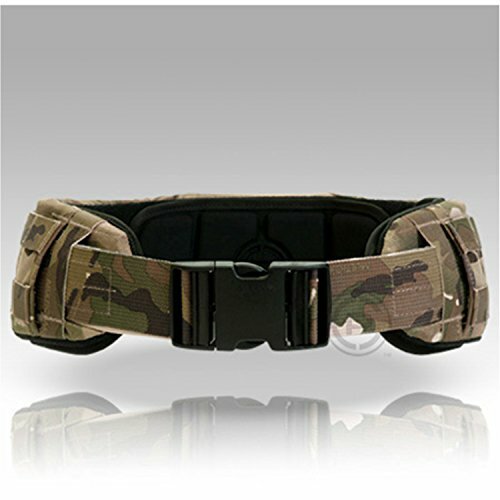 Enhanced Military 2.25-Inch Web Belt (Modernized) - Black, Large will work with this war belt. 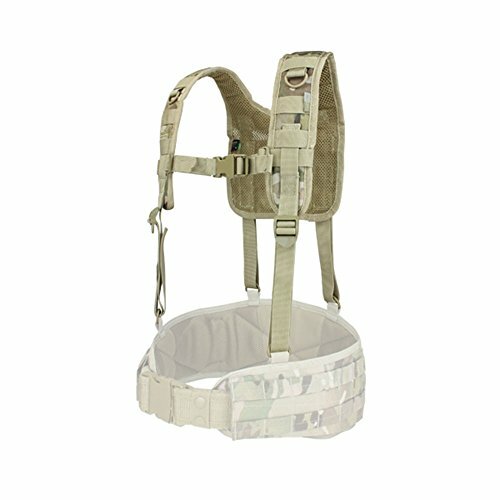 and lastly, Condor also has a very affordable harness – the Condor H-Harness MultiCam by Condor Outdoors. It connects to the four ring attachments, and provides additional support and MOLLE webbing. A battle belt is a core piece of tactical gear. The right model will support a heavy load-out, and be customizable to the individual’s needs through the use of MOLLE webbing. Now that you’ve picked out an outstanding battle belt – consider picking up an IFAK, dump pouch and some MOLLE clips to use with it. Who makes the best dump pouch? We look at what you need in a good mag dump pouch - find out what the best gear is for 2019.